Whenever I tell people I’m a food writer they always assume I have Food Network standards, or that I’m a gourmet cook. And God knows I hate to be a buzzkill, but here I go. Re: the first allegation—while the Food Network does hire some decent people, they also have no problem bringing on hacks who can decorate, or swear, or mug like rock stars, but not, you know, cook. In too many cases, shock value is what goes; the food, let alone the quality of it, is almost incidental. Re: the second—that’s very nice of you, but still no. I’m actually way more boring than that. All I really care about is quality ingredients, prepared in a simple way that shows off how awesome they are. Ta dah. As opposed to the chef wrecking them as a sacrifice to his own ego. Can I please just eat without you handing me your resume with every bite? Well—happy to help—it wouldn’t. And segues right into my first point. 1) For the love of all that is righteous, pick a cuisine. One. Have you ever been to an Irish restaurant in the US that didn’t feature veggie fajitas on their menu along with shepherd’s pie? * Me neither. Restaurants and trying to please everyone are as cliche a pair as Rogaine and a Corvette. Be known for doing what you said you’d do, and doing it very well. 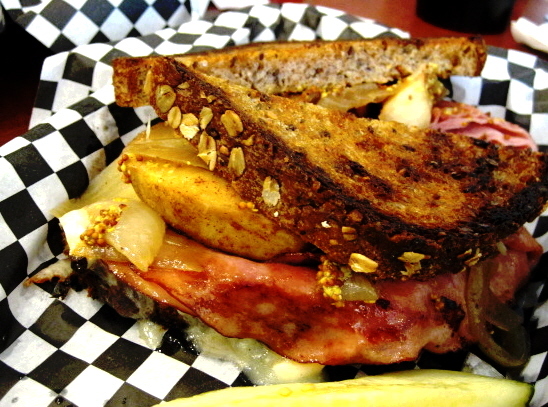 I know a sock hop joint in South Jersey that’s known for their grilled cheese sandwiches (thepopshopusa.com. Count ’em—30 kinds of grilled cheese. Looky above for the one I got, the Haddon.). They’re freaking amazing at it, as evidenced by the happy customers who stand on line to get in without complaint. 2) Don’t throw flavors around like you trained at Chez Panisse. Sometimes restaurants know how to combine unexpected flavors, and the results are successful. Other times it’s as if the kitchen staff wrote down every conceivable flavor on the planet, and some on Jupiter, tacked them to a wall, and then everybody did a shot, then started winging darts at the flavors. Other times it’s clear they’re just cleaning out the fridge. That’s when they add ‘vinaigrette’ to throw us off the trail. Genius move. You forgot the applesauce and the bottom of the Hellmann’s jar. 3) Quit mailing it in. Tomatoes. It’s high season. Buy local ones, for crying out loud. 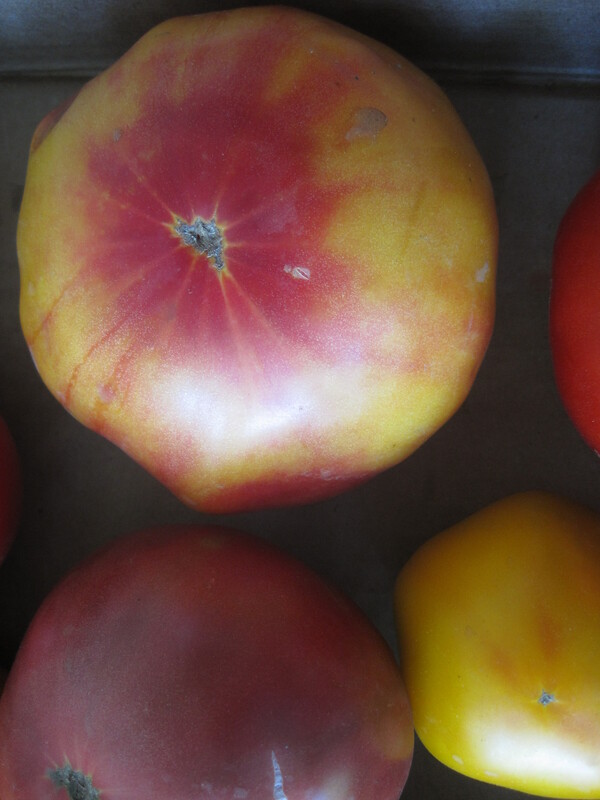 They’ll cost more than the pink ones that taste like wet tube socks, but people will remember how intensely flavored the tomatoes on your sandwiches were. They’ll be further impressed that you source locally (people do want to hear this today) and will be back, begging for it. Go ahead and charge more. We’ll pay it because it’s worth it. Promise. Juicy, runny, and worth licking off your arms. But oh yeah, I’ll cheerfully mock the dessert menu if I sense everything they offer is frozen, and/or was borne of a paper pouch, and/or otherwise tastes like it’s full of fake and acrimony. And wouldn’t they kind of deserve it? Can we all agree that cake mixes uniformly blow? The real thing is chocolate, butter, sugar, flour and eggs. A five-year-old can swing that. $9 for something they shook out of a box is a fat no. Whenever I order dessert out I always ask for it without all of the glitterati. This inevitably makes the server a little twitchy. With a big smile she assures me that the toppings are scrumptious. I am resolute. Then she scampers off to tell the kitchen her customer wants to see what the Toll House pie looks like in its birthday suit. They’ll panic, and, collectively twitchy now, they’ll press their little noses up against the kitchen door’s windows to inhale in short gasps as they watch me eat it. And maybe they’re inspired to mix together some butter and sugar. **I wrote about this in my bora bora post when I said restaurants hand you a dessert covered with goo, betting you’ll be too impressed by this quaking, amorphous blob to notice they’re stiffing you and giggling about it in the kitchen. Hasn’t changed yet, and stoicism is such hard work on my part. Get with it, people.